How's everyone doing? 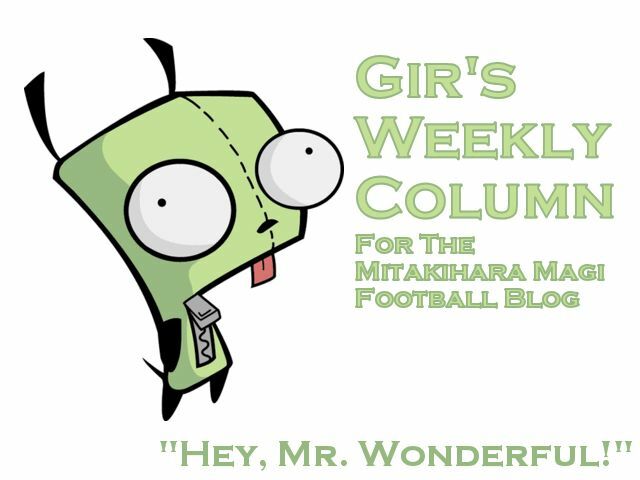 I am Gir Todafunk, your ace cornerback for Tatsuya Kaname's Mitakihara Magi, back with another weekly column for the Magi Football Blog and the Daily Magi newspaper, established 2011. Another week, another national player of the week honor, another conference player of the week honor. Two tackles and nine interceptions, that's all. I'm so good, I even cracked the Heisman Watch list. Hope I can keep it up. This week, we're in Colorado Springs, ahead of our match with the Air Force Falcons. We're actually staying at the Academy Hotel Colorado Springs. This way, we won't have to go in and out of the city. The U.S. Air Force Academy figured that they won't have a chance to beat us, so they decided that having us close to the Academy wouldn't hurt. We won't give away our game plan, though. Classified information. Here are my top 10 places to find good food and good service in Colorado Springs. Escargots De Bourgogne, Calamari, Caprese, Shrimp Remoulade, Mussels & Clams, Oysters, Caesar Salad, Roquefort Blue Cheese Salad...this restaurant is one for the epicurean enthusiasts on a budget. An official Men About Town pub, this is where the local chapter of Mitakihara Athletics boosters gather. The beef boxty, shepherd's pie and beer cheese soup are this pub's calling cards. The finest Greek food can be found here. Saganaki, Spanakopita, Keftethes, Kolokithikeftethes, Organic Hummus, Tzaziki, Dolmades, Dolmadakia, Kalamari, Mixed Mezze...and a lot of gyros. The signature burgers at Drifter's are the Double Cheese Wild Style w grilled onions and the B52. Five Guys, localized. Coach Kaname did eat at this place one time with a few of his wives here. The Hibachi Scallop and Kura's Scallop Butter Yaki are Kura's signature dishes. The chile relleno burrito combo is a smash hit, as well as the avocado pork burrito. This is where the best Mexican food is at in Colorado Springs. Think P.F. Chang's, but localized to suit Colorado tastes. Members of the military luck out here: 15% discount for current active duty soldiers. Hmmm...I wonder if this also applies to members of the Canadian Forces? One French restaurant leads to another. We had our morning breakfast here yesterday, and it didn't disappoint. Coach Kaname seems to have a propensity to favor French restaurants; I just noticed that. Samosas, samosas, and samosas. A lot of couples eat out here and I would imagine that a number of relationships ended here too. If you've ever got your heart broken while having dinner, just remember: I got your back. Not very often do I place Ethiopian fare on this list, but this is a restaurant that does it right. Their signature dish is a sampler of all the different dishes served in Ethiopia and Eritrea. We had our Thursday night dinner here and it was simply amazing. So there are my top 10 places to eat in Colorado Springs. Next week, we head west to Reno, and I rank the top 10 buffets in the city. Keep an eye out for that on my Weekly Columns. This is Gir Todafunk, the undisputed, unbelievable, unforgettable Mr. Wonderful, signing off. You are not alone.